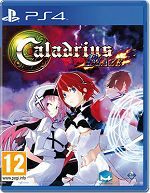 Get excited because after a long wait Moss are bringing Caladrius to the PS4, with english subtitles! Along with fantastic art and cutscenes to accompany the adrenaline inducing gameplay this critically acclaimed shooter is receiving an update, rocketing it onto the must-have list for any PS4 owner with a love for bullet hell shooters! Featuring many of the weapon styles you're used to in Shoot 'Em Ups, Caladrius Blaze retains the gameplay of the original keeping mechanics like the 'Element Shoot System' - a special attack that makes each character unique - intact. 'Elemental Shots', which can be either defensively or offensively, will also retained along with the resource management system 'Element Gauge'. We've come to expect excellence across the board from a Moss title, and Caladrius Blaze takes the original title and doesn't disappoint! The fantastic Suzuhito Yasuda, the artist behind Caladrius (360), Durarara! !, and Devil Survivor, has contributed extra content in the form of new artwork, stages, characters, bosses, and characters!